Well, the Monterey auctions have come and gone, and I have to say I wasn't really blown away by the numbers Porsche lots brought this time around, and only one lot really surprised me. There were certainly a few bargains had by savvy buyers, and some of the weekend's biggest Porsche lots were either "No Sales", or "No Shows". There were only a couple of lots that exceeded their pre-auction estimates, and the vast majority were either on the low end of their estimate spectrum, or below. A whopping 27 Porsches left their respective auction stages without selling, accounting for more than a third of the lots. Is the Porsche market bubble on the downturn now? RM's biggest Porsche lot, the Wynn's/Hotchkis IMSA GTP 962 went unsold on Friday night, which is pretty telling. I know that this car was talked about a lot leading up to the sale, and the fact that not one person in Monterey on Friday wanted to buy it for a reasonable price was a bit surprising. The auction house did, however, manage to get pretty premium money for the rest of its vintage air-cooled lots. $440,000 for a speedster is a decidedly strong sale, and $308,000 for an early short-wheelbase car is nothing to sneeze at. Another Monterey auction, another headliner Porsche goes unsold. The 908/03 at Bonhams was a gorgeous car, and certainly deserved to reach the high end of its estimate (around $2 million), but the bidding just fell short. Surely this no-sale is a disappointment for the seller, for the auction house, and for the enthusiasts. Ultimately, their top seller was a different Porsche race car, a 1974 Carrera RSR brought in $1.1 million dollars. A paltry sum, I'm sure, for a car with this kind of history. This 74 RSR ran at the Daytona 24 hour race 8 times, and the Sebring 12 hour race 7 times, not to mention countless other races, and it's hard to find history like that. I'd call this one a good buy. Bonhams also sported a 'tale of two Carreras', in which one 2.7 RS sold for just shy of a million dollars, and another 2.7 RS sold for less than half that. The main difference? The original numbers-matching engine. The car that sold for $462,000 was ostensibly the better car, as it was the more original body of the two. The near-million dollar car on the other hand, has been restored twice, repainted a handful of times, and some rust repaired. Both cars are immaculately presented, but the half-price Carrera had suffered an engine fire almost 25 years ago, and the 2.7 liter engine in the car now was not the same one that was in it in 1973. Is that worth $500 grand? The market seems to think so. Unlike the other sales, almost everything Gooding brought up to the stand went out with a hammer fall sale. Their sales were solid, and their cars were well up in the 6 figures. A 58 Speedster at $415 grand, a 65 911 at a whopping $405 grand, and a Carrera 2 Coupe at a touch over half-a-mil are all very strong for their markets, and the sellers are probably pretty happy with their Gooding & Co. experience. I can't help but think of the potentially higher dollars that might have been gotten with a 917K headliner, but alas its all academics at this point. 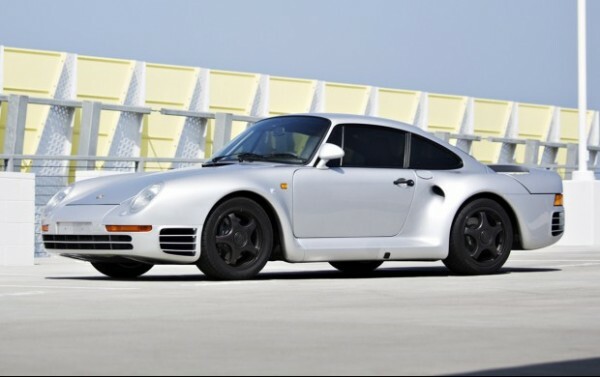 With the 917 sitting this sale out, the big talking point here is the 959 Komfort that sold for well above estimates, and frankly well above the 959 market at $1.5 million dollars. As far as I can tell, a perfect 959 had never sold for above the 7 figure mark until the beautiful red 959 Sport sold this spring at the Amelia Island sale. For a one-of-37 car like the 959 Sport, the million dollar sale made sense, but this Komfort model selling for another $500 thousand on top is a bit surprising, as there were 300 of them made, and they are almost 10 times less rare than the Sport models. Prior to this, Komfort models were struggling to sell at $750,000, but somehow this one managed to double that figure. The source of that vast majority of Porsche auction lot No-Sales was Mecum, and frankly that's to be expected. Mecum seems to be more concerned with turning lots through their auction than they are about the sales numbers. A quantity over quality approach to medium-to-high-end auctions I suppose. That said, a couple of their lots were quite nice, and managed to fetch decent dollars. Their headliner, the 962 Kremer K8 Daytona-winner sold at just a bit under a million dollars. Probably the best car for your 7-figure money in the Porsche world at Monterey this year, in my humble opinion. You simply can't find an historic endurance race winner from the Porsche fold for under a million these days, so when one comes up for sale and falls short of a million, you've won yourself a bargain. It's a gorgeous car, it's got credentials, and it will be welcome at any vintage racing event in the world. Let's hope the new owner brings it out to the Daytona Classic race this fall. In addition, another nice buy was this Carrera 2.7 RS at $650,000. It's well restored, looks the part, and no high-end Porsche collection would be complete without one. While not a perfect car, it's certainly worth what was paid here, and this was another case of the buyer getting the long end of the stick on this deal. That's a lot of car for the money, and the 2.7 RS market doesn't show any signs of slowing down.